Okay, this is ridiculous. 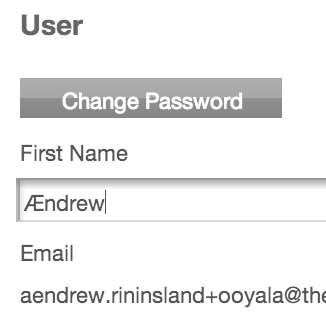 I registered with Backlot using the address "aendrew.rininsland+ooyala@mydomain..." so I could more easily filter messages (If unaware, the +whatever part is ignored by the mailserver but remains in the message headers, allowing for super easy filtering). Great point, but I see new user registrations in real time. If I saw anything like that added to the community, I would immediately block the account. Check out our latest Ooyala Engineering Blog! Your user name is tied to the SSO of your Backlot account, you will need to change the email on that account, or add a new user name as shown in this article. Note: The forum platform (Lithium) takes all characters from the email address after a "." or "+" and uses that for the community name. Let me know if you have any concerns. And I should've known that when I created the user account, right? That kinda seems like a security issue. What if somebody used the email whatever+ooyala_admin@somedomain.com — making their username "ooyala_admin" — and then used that to phish for user passwords via the PM system? Good to know! Thanks for the response! Sidenote though, it won't let me change my email in Backlot — any idea why?